I'm posting these sketches as an example of what I am always suggesting to my Sheridan Animation students. That is, before finalizing a character design you should take it out for a "test drive" to see how it's working. A common mistake I've found is that a student will draw one or two views of a character and be instantly sold on it. I maintain that you should never nail down a character design until you've sketched it many times over, trying it out in various animated poses. Many's the time that I've found that a design that looked good to me initially proved to be awkward to move around into different poses. When that happens, always be prepared to make whatever modifications that may be necessary to make it work better. 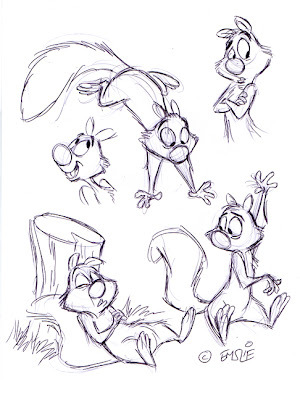 In these 2 sets of sketches, I've just allowed my stream of consciousness to take over, doodling my squirrel in whatever pose and attitude that happens to flow out of my pencil naturally. None of these sketches are finished in any way and they may not even show him in altogether consistent proportions. In fact, sometimes I find that more ideal proportions may develop quite naturally through the repetition of drawing him out in different poses. Likewise, the facial features may evolve into a more appealing design through trying various moods and expressions, as well as tilts and angles of the head. Even my approach to construction is looser at this stage. To dwell too much on structure right away would be a hindrance to developing him as a little personality. For me, this is what is most fun about drawing. I love to just do little rough sketches like these to get a performance on paper. Admittedly, I am much happier having made a career being a cartoonist in the print medium. The only way I would want to be involved in animation is if I could draw in this "organic", fully dimensional way that pleases me. I'm not much of a fan of today's flat, graphic styles, I'm afraid. These are absolutely delightful! Thank you for sharing the thought process behind your work. You were born 30 years too late Pete! Brings to mind the work of Bill Justice and Eric Larsen. Keep posting so the kids remember what you do with a pencil when you get as good as Pete Emslie! 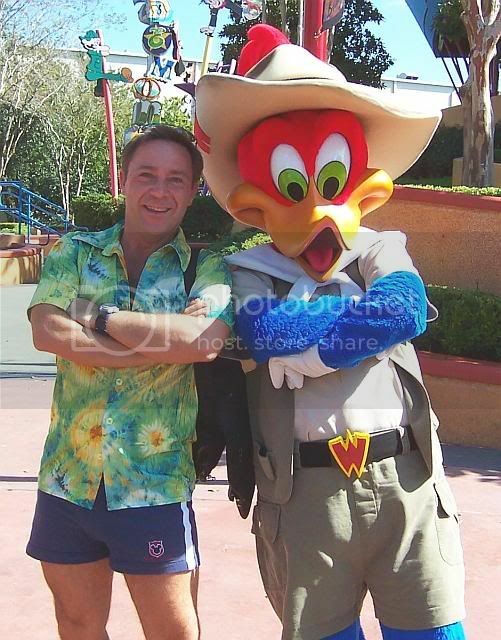 I got to know Bill Justice back when I was working at Walt Disney World, as he used to come out that way as a frequent Disneyana convention guest. I'm flattered to have my cartoons be compared to his work! Actually, I've always most closely identified with John Lounsbery's approach. He had this really sketchy, "shaggy" style of drawing where the resulting linework just had such spontaneity. I think his animation really excelled during the Xerox period at Disney, when it could be seen in all of it's glorious looseness! I like your cartooning too, by the way, as I checked out your blog. It's really funny! Also, I gather from your list of favourite films that you're a fellow Jacques Tati fan. I like "Mon Oncle" too, though my favourite of his films is "Playtime". I love John Lounsbery after Kimball the most! He was the only guy who could keep up with Kahl but also had a warmth to his work! Your stuff is really quite inspiring! The Faculty and powers that be at Sheridan should make your drawing classes a mandatory stop before the unwashed masses even touch a computer. As I write you my kids are watching Goliath and Lounsberys credit as animation director just came up....Man that guy could draw elephants! I wanted to tell you i have a menu you did with the Jungle Book characters for WaltDisney World hanging in my office. All the best and I'll spread the word about the cartoon cave. Oh and yes Tati is tops with me! I saw the new criterion Playtime DVD and thought about grabbing it. Perhaps i will now that you mention it. Got SO excited about your work I forgot to say thanks for the kind words! Ah yes, the kid's menu of "The Jungle Book". Of everything I worked on during my time in the WDW art department, that item was my favourite project. Not only was it an opportunity to draw and paint those great characters, but it was a lot of fun trying to match the painting style of the film's backgrounds done by Al Dempster. It was a very odd size, being made up of five panels that folded up into a square. With those extreme dimensions, I recall that I had to paint it size as, rather than 25% to 50% up as I usually tended to work. As you know, on the flip side of the menu was an inkline drawing of Kaa the snake that the kids could colour in then punch out and curl around to place on their heads like when Kaa has coiled around Mowgli. By punching out the snake, it inevitably ruined the front illustration, so kids were starting to ask for two menus each. This was something the restaurant hadn't anticipated or budgeted for, so at some point the item was discontinued for cost reasons. Fortunately, I was able to get a small pile of samples from our print coordinator before it was retired. I'm glad you like the illustration, Jason. I always thought Shere Khan fending off the monkeys from stealing his ice cream was kind of a funny, albeit rather absurd concept! Before you test drive your design of the squirrel, could you please explain your process of creating appealing character designs? i.e is it intuitive? Or is there a formula that you follow? Mostly the process is, as you say, "intuitive". However, before I put any lines on paper I have to have a clear idea of what I'm trying to accomplish. Again, using my "test drive" analogy, I have to know where my "final destination" is before I "get behind the wheel"! So my first job is to know what the character's persona is supposed to be. Is he a hero or heavy? Sweet and sympathetic, or a bit of a wiseguy. Smart or stupid, outgoing or shy, etc., etc. 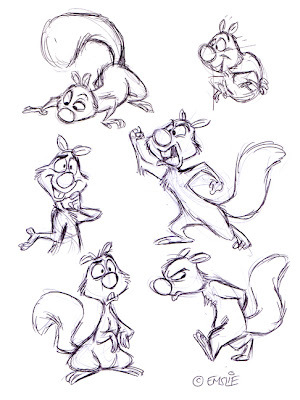 All of these personality traits are going to in some way dictate my design, especially as I play around with body language and facial expressions as in these rough sketches of the squirrel. In his case, I'd say that I see this guy as a bit of a neurotic, easily irritated little rascal. Sort of the "George Costanza" of the squirrel world. In the early stages of design, I may play around with graphic shapes to some degree, thinking how the shapes, lines, and proportions of the various parts are going to relate to each other and result in an appealing overall silhouette. All of this stage has to support my vision of what his "character type" is. Again, much of this process is, at this point in my career, pretty much intuitive. In other words, I don't always think about such decisions consciously - I just do what "feels" right to me visually. I hope that helps to explain the process a bit. Maybe I'll try to expand on these thoughts in future posts. Thanks for your question, Cory, as I appreciate these kinds of discussions. I know that when I'm looking at other artist's work, I'm also curious as to their creative approach. Sharing insights on how we work is what helps us all to learn from each other and improve our own skills! Love'im!!!! Such personality, weight, depth and soul! These are simply amazing! I wish that there was a book on how to draw (from conceiving an idea for a character to full execution) your characters, such as the squirrel here.. :)) I admire your work.. it has both character and expression - it's not "dead" like some of the other cartoonists' pieces. 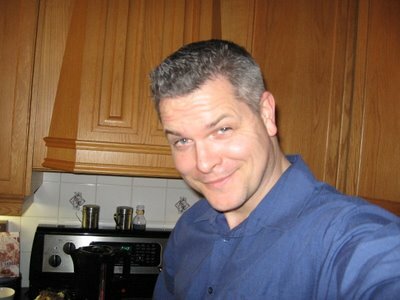 Was reading John K's site and followed the link to yours.. what a fantastic site! Im looking forward to reading all these great articles.. Thank you so much for taking the time and sharing all this great info! And I'm a huge fan of "Blackbeard's ghost" too! of style we are looking for. (say 10% of sales?) on these. piggy-back for some free hosting. I'm glad you like my squirrel cartoon, but I'm afraid I really can't allow any use of my work for free as this is my livelihood. Also, I do not work with vector art, just real brush and ink illustrations scanned and coloured on Photoshop.